Guess there's no escaping the effect of unusual destructive storm season in East Asia. We recently had powerful earthquakes and tsunamis that killed 3,000 people on the Indonesian island of Sumatra and 150 in Samoa. We also had typhoons after typhoons battering China, Taiwan, Philippines and Vietnam. The U.S. was not spared either, with tropical storms and hurricanes lashing on some states. In addition, a series of three earthquakes measuring 7.8, 7.7 and 7.3 on the Richter scale struck between Vanuatu and the Solomon Islands. This morning, San Francisco's first storm arrived with winds up to 70 mph. I know, 70 mph is nothing compared to the winds in East Asia's typhoons but we don't get this kind of strong winds. It's pouring right now as I'm typing up this blog. Around this time of the year, what's normal for us is normal rain not a storm. It has been only a couple of hours into the storm and we already had flash flood warnings and power outages in some areas. Our storm today is fueled by the remnants of Typhoon Melor which slammed into the island of Anatahan and then steered towards Guam, Saipan, Tinian before reaching Japan on October 6. Just days earlier, Typhoon Parma wrecked havoc in the Philippines. 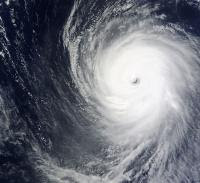 Some experts said that a more deadly super typhoon is very likely to be in the horizon in East Asia. Wow, a super typhoon...it's such a scary thought. The recent typhoons already caused so much devastations, imagine what a super typhoon would do. Up until now, I didn't think typhoons would have any impact in my area until this morning when I learned that our storm was from the remnants of a typhoon. To make matters worse, San Francisco is expected to have a big earthquake within 30 years with some experts saying that we are overdue for the next big one. Anything can happen to us, a tsunami, an earthquake, or tropical storm. Of the three, I fear tsunami the most because for one, I do not know how to swim, and two, there's no place to run or hide when it comes. At least with an earthquake, you can take cover to somewhat protect yourself. I use "somewhat" because I've lived through the 1989 earthquake and saw collasped highways, bridges, and homes. No where is safe in an event of a strong earthquake.